-1- Is it over yet?! -2- I'm going to be networking - Is this good or terrifying? 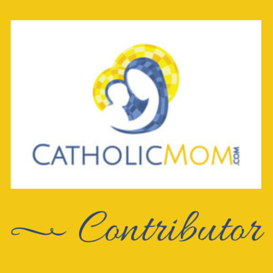 In exactly one week, I am traveling to Boston for the annual Catholic New Media Conference. I cannot even tell you how excited I am. I'm also meeting up with my sister Shauna'h and we're going to the conference together. WE'RE GOING TO MEET FR. RODERICK. I have listened to Fr. Roderick's podcasts for *years* and now I will not only meet him in person, I will demand a photograph with him. Stay tuned to my Twitter account for that one. :) THIS IS EPIC, PEOPLE. -4-"Just a minute Honey, only 1 lamb to go to meet my nightly quota!!" -6-"Oops, sorry! Is your head ok?! My right wing got away from me." Have a great weekend everyone! 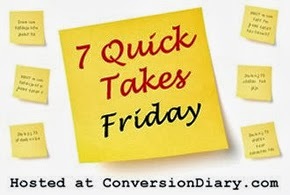 Don't forget to go check out other 7 Quick Take posts over at Conversion Diary! Please share if you find good Advent music. I've been trying the last couple of years to make my Advent more Adventy and less Christmasy but I haven't found much Advent music.